Buy water in bottles or from machines in most grocery and health food stores. Bottled water comes from a variety of sources. Spring water is the most common. Most is micron filtered and ozonated, and may be treated with reverse osmosis and ultraviolet light as well. Mineral water contains calcium and other naturally occurring minerals. Distilled water is extremely pure, but the resulting liquid is virtually mineral free and flat tasting. Sparkling water can be naturally occurring, or can be sold as seltzer or club soda. 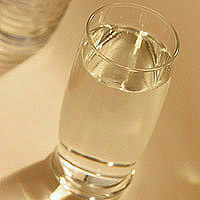 Mineral water may contain high levels of sodium, so check labels. Here are brief descriptions of common water purification methods used today. Water is exposed to ultraviolet light that destroys biological contaminants and inactivates viruses and bacteria. This treatment is ineffective against organic and inorganic contaminants and does not inactivate giardia (a parasite) cysts. Water is passed through micro-fine carbon filters that absorb or modify contaminants, including some biological and most organic contaminants. Filters don’t catch all viruses or radioactive pollutants, or very tiny parasites. Water is passed through an ultra-fine membrane under pressure, reducing inorganic contaminants and some radioactive materials. Viruses can remain in the water after reverse osmosis processing. Water is boiled and the resulting steam is captured and cooled into fresh water. Although this method is thought to be the most reliable method for purifying water, it doesn’t remove certain compounds, such as gasoline and petroleum-based solvents.